Former Clare hurling legend, Jimmy Smyth has died, aged 82. Smyth, without doubt the greatest hurler never to win an All-Ireland medal, was once described by his close friend, the late great Christy Ring as “the best hurler bar none”. “He played the game at the highest level from the 1940s to the late 1960s, playing with and against some of the greatest who played the game like Christy Ring, the Rackards, and John Doyle. He was on a par with them and they recognised him as a great, great player. “That says it all about Jimmy really and he will be sorely missed in Clare, because apart from all his hurling, he was a great, great Clare man and a past-president of Clare GAA,” McDonagh concluded. Smyth represented Clare on some 146 occasions between 1948 and 1967. In the GAA’s Centenary Year – 1984 – he was chosen at right corner forward on the ‘Team of the Century’ though during a barren period for the Banner County sadly Smyth’s only county honours was an Oireachtas Cup winners medal in Clare’s 1954 win over Wexford. He was later selected - in the same position – on Munster’s Hurling team of the Millennium. The Ruan native was a ‘permanent fixture’ on the Munster team in Railway Cup competitions winning eight Interprovincial medals, the first in 1952. He again helped Munster win in 1955, then a five- in- a row 1957/1961 and his last winner’s medal in 1963. With his native Ruan he won his first County senior title in 1948, at the tender age of 17, and again in 51, 59, 60 and 61 – since his retirement from the game Ruan have won but one Clare title – an Intermediate championship crown. Jimmy was educated at that great hurling nursery, St Flannan’s College in Ennis whom he helped to win three Harty Cup crowns and three All-Ireland Colleges titles during the forties. After retiring from the game, he became President of the Clare GAA as later joined Croke Park as an Executive Officer, which post he held until 1988. After his retirement from Croke Park he completed a Bachelor of Arts degree at Trinity College in 1993, with a thesis based on the songs, poems and recitations linked to Munster GAA history. On the field of play, one of Smyth’s finest hours, was against local rivals Limerick against whom he shot 6-4 in their 1953 Munster Championship encounter. Graveside Oration by Ruan's All Ireland Senior medal holder Cyril Lyons on behalf of C.L.G Ruadháin 12-02-2013. To come and stray on my native clay and o’er your field to roam. The love of Clare and it’s balmy air and your own fair place Ruan. Jimmy Smyth loved ballads and this verse is from his favourite local one simply titled “Ruan”. ‘Twas here in the village just over 82 years ago that it all began for him. Growing up with his parents, three brothers and a sister, he would have witnessed at first hand all the activities that that took place on a daily basis, from farming to bringing water from the well to the shoeing of horses in the forge. Porte Hill here in front of us was, as he said himself, his home and his playground. He was consumed by the game of hurling from an early age. In many ways hurling became his life. This field adjoining us here was where all the underage hurling was played. Hazel sticks called “spocks” were used when hurleys were not available as were sponge balls, canisters and torn leather balls, picked up here and there on the quiet. Of Ruan’s first winning senior championship team, 10 players learned their hurling here with Jimmy. He often remarked in later life that, such was the level of activity there, that the corpses here in the graveyard were never lonely. As a measure of greatness in competitive sport, full names were often considered unnecessary and so it was with Jimmy Smyth. Here in Ruan and throughout the county he was simply known as “Smyth”. He put this parish, village and club on the map. His contribution to all the teams he was to play on was immense. Throughout his long career he left an indelible mark on those who saw him play on the hurling fields of Ireland. He was powerfully strong and was blessed with a marvellous pair of hips. He had dashing speed, great ability to break a tackle and a bullet of a shot. Jimmy played five years on the St. Flannan’s College senior hurling team winning three Harty Colleges’ medals and three All Ireland Colleges’ medals. Such was his size, physique and strength then, that he was secretly known as "Gulliver" among the other students in the college! His inter county career began at 14 years of age lining out with the Clare minors and continued for the next 23 years at all levels. Of the 156 adult matches he played he scored an incredible 149 goals and 323 points. His record score of 6-4 in the Munster championship of 1953 still stands. One of his most outstanding performances was in the 1954 Oireachtas Final victory over Wexford - Míchéal ÓMuircheartaigh remarked that the goal he scored in this match was one of the greatest he ever saw, - “He ploughed through several of them and had nothing in his mind but a goal” - was his colorful description of it. While his greatness as a player was not dependent on it, he never tasted championship success with Clare It frustrated and disappointed him and so the success of the 90's for Clare brought him great joy. He understood that the breaking of the psychological barrier was the key to glory. He believed that the hurlers of his era were equally as good but they had no Loughnane! In his victory speech on that famous September day, Anthony Daly's acknowledgement of the heroic efforts of past teams to bring success to Clare, or as Jimmy himself described it; his "genuflection to history" touched him deeply. Jimmy's performances for his county meant he was selected for Munster for twelve years, winning eight interprovincial medals, this, at a time when these competitions were second only to the championship in stature. He was also honoured by the Irish selectors on six occasions during this period. Selection on both County and Provincial teams of the Millennium were further evidence of his great hurling ability. It's no coincidence, that Ruan’s most successful period in its club history, went hand and hand with that of Jimmy’s adult career. A strong and successful club career compensated for the lack of success at county level. Between ’48 and ’62 Ruan contested eight senior championship finals winning on five occasions. He started out as the boy wonder at 17 winning his first championship and finished up as captain and Commander in Chief, fourteen years later. To a man, his teammates would testify to his greatness as both a player and leader and when all other things were equal, Jimmy was the difference. He was as highly regarded for the manner in which he played the game as he was for his achievements on the pitch. He passionately believed that hurling should be played in a sporting manner and had no time for foul or indisciplined play. If you could not shake hands with your direct opponent after the match the game was all the poorer for it. At the official opening of Páirc na nGael Ruan in 1971 an exhibition game was played between a Clare and an All Star selection. While the game itself was unimportant the fact that so many of the games greatest players of the 50’s and 60’s , including Christy Ring, Ollie Walsh and John Doyle, lined out was an enormous tribute to Jimmy and his standing in the game among his peers. In 2008 Ruan GAA acknowledged both his greatness as a player and his contribution to the club with the unveiling of a sculpture in his honour in the village. In erecting the sculpture, the club also committed to keeping his memory and achievements alive and sowed the seeds that others would be inspired to follow in his legendary footsteps. Led by the Tulla pipers, players representing seven decades of club and county marched with Jimmy, his family, friends, teammates and supporters to the Móinin field for a fitting tribute to him. To be so honoured in his own parish by his own people was for Jimmy the ultimate tribute. Jimmy’s introduction of ballads began at an early age. The Lovely Back Roads to Dromore a hurling ballad written by Mickey Kelly, a local shoemaker, was known and sung by everybody. For him ballads express a love and pride of place and people and give us a sense of importance. It was this background that motivated him to complete his thesis and publish his collections of ballads. His own personal favourite, which you heard sung as his remains left the church was "The Ballad of Tommy Daly" written by Bryan Mc Mahon. According to Jimmy it is the greatest GAA ballad written and was his party piece for as long as I can remember. He never forgot or failed to acknowledge the contribution that his fellow club players made. He believed that the club was the inspiration to the longevity of his own great career at county and provincial level. The regard he had for his teammates was in later years clearly shown with his attendance at the funerals of all those that predeceased him. Without fail, he would travel from Dublin, lead the guard of honour and give the graveside oration for a deceased teammate. This practice he began in the late ‘80s and continued until recently when failing health prevented him from doing so. On his visits home, he continued to call to families of former club members. In Dublin he made it his business to visit Ruan people hospitalised there. For Jimmy it never ended with the fields, it went way beyond the fields. We started with a verse of his favourite local ballad and we’ll finish with the last one from the same song. For you’ll get a rousing welcome when they hear you’re from Ruan. Ar Dheis Lámh Dé go raibh tú, a Shéamais. Jimmy Smyth (centre) in action for Clare during the 1953 Oireachtas Cup final at Croke Park. Cyril Lyons fulfilled Jimmy Smyth’s dream for Clare when he was a member of the All-Ireland winning side in 1995 – a victory he had hungered for all his hurling life, writes Joe Ó Muircheartaigh. Cyril Lyons was on the steps of the Hogan Stand to hear Anthony Daly’s words, having played his part out on the field. Jimmy Smyth was in the stand and along with other past-masters had played his part – it’s what Anthony Daly was talking about. It’s one of Cyril Lyons’ great reflections on Jimmy Smyth and his hurling life. Ruanman. Clareman. How important it was for him, in life and in hurling to have seen Clare finally reach the promised land. The dream that Lyons was privileged to be part of – the dream stoked in Ruan on the back of the club that had made Ruan famous. The dream stoked in Clare and everywhere, thanks to Smyth and what he could do on the other side of the whitewash. “He put the club and the parish on the map,” says Lyons. “Jimmy Smyth and Ruan were synonymous with each other. For people who travelled outside the county – no matter where they went in the ‘50s and ‘60s and if they said Ruan the next thing someone would say was ‘ah that’s Jimmy Smyth country’. “I never saw Jimmy play, but I’m relying on the valued opinions of older people and from an early age Jimmy was marked out as special. When you see that he played senior colleges hurling for five years – from his first year to his fifth year in St Flannan’s he was playing Harty hurling and played minor hurling for Clare at 14. “He played his first senior game for Ruan at 16 years of age, he told me. It was against Smith O’Brien’s in 1947 and the following year he was centre-field on the Ruan team that beat Clarecastle in the 1948 final. “Ruan had never been in a senior final before and Ruan’s best time in senior hurling co-incided with Jimmy Smyth’s adult career. It was no coincidence. There were other outstanding players on that Ruan team, but what the players from that era would always say was that when all things were equal on days it was Jimmy’ ability that made all the difference in matches,” adds Lyons. Lyons followed in the Ruan tradition – he also followed Smyth to St Flannan’s College and emulated his achievement in winning a Harty and All-Ireland title in 1978. “I went to St Flannan’s College, not for an education but to play hurling,” he admits “and I’m sure I was no different to many of the boys that went there. The fact that we got an education as well was a bonus. “We were so lucky in St Flannan’s in my time. We had Fr Gardiner and Bishop Willie Walsh as coaches – they had been past-pupils in Flannan’s and Bishop Willie was in Flannan’s when Jimmy Smyth was there. “They had the legacy of that succcess and they passed it on to other people. There was a certain expectation that St Flannan’s would have good hurling teams because of what the school did in Jimmy’s time,” he adds. But it’s back to Ruan that Cyril Lyons and everyone else from the parish defaults to when thinking of Smyth and the everlasting affection with which he will be remembered there. “He went to Dublin in 1964 but he never left Ruan,” says Lyons. “He always came home and he always came to the funerals of the players that he played with. It would be easy to say ‘I’m living in Dublin and I can’t make it down’, but he never failed to make it down. For subsequent generations in Ruan they’d remember him more for that because they would have never seen him play. “The players who played with him in Ruan would always say, it wasn’t about his achievements from his hurling days but how he played the game. He had no tolerance of foul or indisciplined play. “He had done many interviews and he said once about hurling and the way it should be played ‘if you couldn’t shake the hand of your direct opponent after the game the game was all the poorer for it’. He was a great hurler, but a gentleman. Hurling people in Ruan, greater Clare and beyond are thinking of Jimmy Smyth this week. And, they’ll never forget him. JIMMY SMYTH, Clare hurler extraordinaire, witnessed the spectacle of All-Ireland finals from a perspective he never experienced as a player — after joining the staff in Croke Park as an executive officer. That was near the end of a glittering inter-county career which saw him acquit himself in the company of some of the greatest names in the game but which was largely unproductive in terms of title wins other than in the inter-provincial series. However, it’s not as if he feels cheated by the Banner’s failure to win even a Munster championship during a career which last 19 years from 1948, when he made his senior debut in the National League as a 17 year-old. It’s not something he would boast about, but more than four decades on from his retirement, he enjoys a reputation as one of the legends of hurling. And, at 80, that’s something to be proud of. What he does treasure are the friendships he made — with the late Christy Ring and the recently deceased John Doyle holding a special place in his affections. "All-Ireland medals… all you can do is look at them,’’ he says. Anyone who was around to watch him win Dr Harty Cup and All-Ireland colleges medals (three in each case) with St. Flannan’s would have felt the Ruan native was destined for greatness. He was a county minor for five years (during which time he won a juvenile medal with his club) and his graduation on to senior ranks in 1948 was swift. He played in two Munster finals, one in his last year in 1967 and the first in 1955, when Limerick beat them by ten points. Two years earlier Clare defeated them 10-8 to 1-1 in a first-round game in which he contributed a whopping 6-4. In 1952, he won the first of eight Railway Cup medals and his involvement in the competition helped to consolidate his reputation as a forward and competitor of outstanding ability. While pointing out that Clare suffered championship defeats by small margins in many games during his time, they were still regarded as one of the ‘weak’ counties. The problem, as he perceived it, was they were nearly always missing ‘four or five’ quality players. "We always had 11 or 12 very good hurlers. It was a shame that we didn’t have the others." For him and other Clare players of his generation, the Railway Cups provided a platform to perform on the big stage. He mentioned the name of Laois forward Christy O’Brien, commenting: "I regarded him as one of the best full-forwards of my time. It’s important that fellows like him are mentioned because he was a great hurler. And Des Foley, whom I reckon to be the best midfielder of all-time, was another great. "I was recognised for the simple reason that fellows like Ring and John Doyle gave me publicity for my hurling. The inter-provincials were there and the weaker counties could get into them. But, if you didn’t have them, the weaker counties had nothing." Playing with the ‘greats’ was one thing. The other side of the coin was that it increased the desire to be successful with Clare. And they didn’t ‘have it’ until Ger Loughnane in 1995 helped deliver the first All-Ireland tile in 81 years. There was no other person that could have done it, except Loughnane,’’ he said. "He had that kind of a personality. 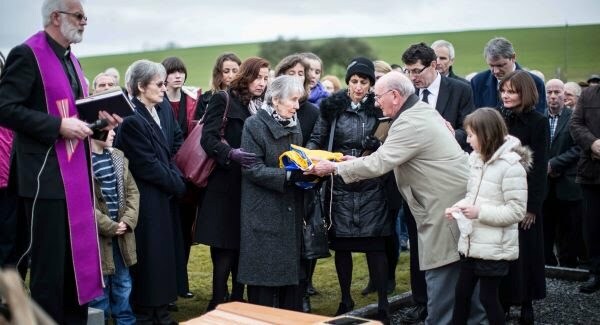 He didn’t please everybody, but he certainly brought an awful lot of happiness to Clare people at home and abroad." Smyth was never short of confidence — "you might say I had a swelled head, but I hadn’t" — which meant that he never felt inferior to the top players who had the opportunity to parade their skills on All-Ireland final day. His philosophy was that a player ‘either knows he is good enough or he doesn’t’. "If you have any lack of confidence in yourself going out playing you won’t produce the goods. I just felt I was on an equal footing, with the exception of Ring of course. "He was the greatest of all time, the ‘best’ man I saw. With Mick Mackey, I saw him playing, but not at his best. A lot of people I met back in Clare always reckoned that Mackey was the best. But, you can’t decide. They were totally different people, personality-wise and hurling-wise. I met two great hurling heroes in my lifetime and they were Christy Ring and Nicky Rackard. In any field of activity, there is always someone within your own group that you look up to. "And as I continued on hurling, all my heroes were dropping before me because I was getting better myself — until the very end when they had all ‘dropped away’ and I was only left with Ring and Rackard. These were the two men that I really looked up to.’’ When he left Croke Park after 23 years service (he was the long-time Secretary of what was known then as the Activities Committee, now the CCCC), he pursued third-level education when he went to Trinity College to study philosophy. "I had to do something and I did more than what I did while I was in Croke Park, or before it,’’ he explained. After Trinity, he studied in UL, where he did a Masters on GAA ballads — producing three books on ‘The Ballads’ of Clare, Cork and Tipperary. While naturally keeping an eye on Clare’s progress — "they have a fair team at present if they could ‘rattle it out of them, but it will take some doing" — being resident in Dublin means he takes a special interest in the progress of their hurlers under Anthony Daly. "I was delighted when they won the National League because they have been trying for over 70 years. You can ‘see’ Daly in the team the way they play."